A snowy day in Carle Park west of the Urbana High School. On the right is a statue of Abraham Lincoln by Lorado Taft. Urbana /ɜːrˈbænə/ is a city in and the county seat of Champaign County, Illinois, United States. The population was 41,250 at the 2010 census. 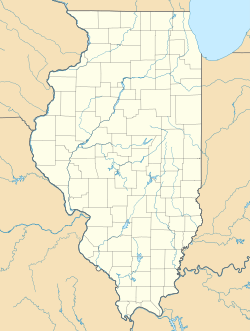 Urbana is the tenth-most populous city in Illinois outside of the Chicago metropolitan area. Most of the campus of the University of Illinois at Urbana-Champaign is located in Urbana. The Urbana area was first settled in 1822, when it was called "Big Grove". When the county of Champaign was organized in 1833, the county seat was located on 40 acres of land tendered by Col. M. W. Busey, considered to be the city's founder, and the name "Urbana" was adopted after Urbana, Ohio, the hometown of State Senator Vance. The creation of the new town was celebrated for the first time in July 4, 1833. The first mills were founded c.1838-50, and stores began opening beginning in 1834. The town's first church was built c.1840, with the Baptist Church following in 1855, and the Methodist Church in 1856. The Presbyterian Church was founded in 1856. The city's first school was built in 1854. Urbana suffered a setback when the Chicago branch of the Illinois Central Railroad, which had been expected to pass through town, was instead laid down two miles west, where the land was flatter. The town of West Urbana grew up around the train depot built there in 1854, and in 1861 its name was changed to Champaign. The competition between the two cities provoked Urbana to tear down the ten-year-old County Courthouse and replace it with a much larger and fancier structure, to ensure that the county seat would remain in Urbana.